What It’s About: A team of astronauts travel to a distant planet and find an upside down world where apes are the dominate species and man is a mute savage hunted nearly to extinction. Can George Taylor (Charlton Heston) find the secret of the Planet of the Apes? Why Watch it Today? : Planet of the Apes most iconic image features The Statue of Liberty, dedicated on this date in 1886. 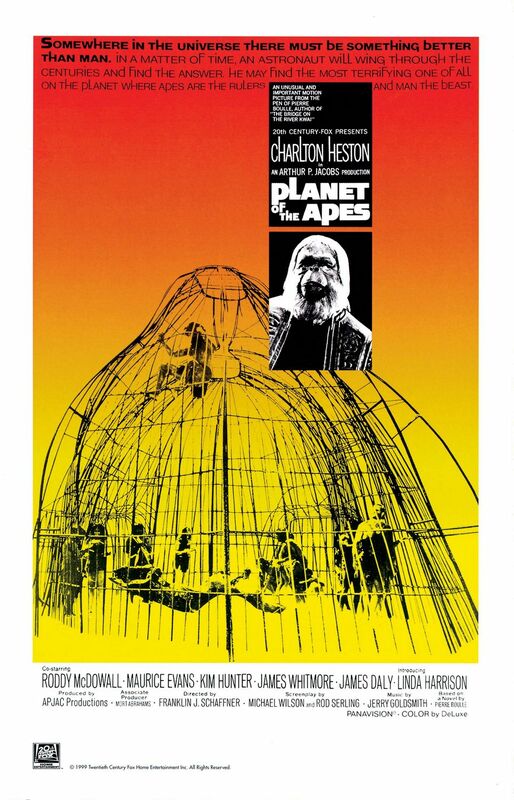 This entry was posted in Adaptation, Adventure, Apocalypse, Based on a Book, Dark Future, Movie of the Day, Mystery, Sci-Fi, Space Travel, Speculative Sci-Fi, The Original and tagged "The Forbidden Zone", apes, astronauts, Best Costume Design Nominee, Best Makeup, Best Score Nominee, Charlton Heston, cryogenic sleep, desert, desert planet, Franklin J. Schaffner, James Whitmore, Jerry Goldsmith, Kim Hunter, New York City, nuclear war, Pierre Boulle, Rod Serling, Roddy McDowall, scientists, space exploration, spaceship crash, Statue of Liberty, twist, zoo. That’s quite an introduction to cinema! I honestly am not sure what my first movie is, but I think it was Star Wars sometime before Empire came out. I was very young, but I remember my uncle showing up at our house and saying that it was playing again and taking my mom and I to see it. My earliest memories of anything Apes was either the TV show or the cartoon in reruns sometime in the early 80s. Then when I was something like 5 I watched Escape From the Planet of the Apes at my uncle’s house. Some how I ended up seeing Conquest and Battle for before I saw the original, which I probably rented or borrowed from the library. I remember even then being impressed by how different it was in vibe from all of the sequels (which are fun, but definitely not in the same league). That Goldsmith score is amazing, I can see why it got into your head. I didn’t even know they had an uncut version of Conquest. We saw that remake, my siblings and I. When we left the theater one of us said “I would have left but I didn’t want to make you guys feel like you had to go too.”which was how all three of us felt. Yeah, after seeing that remake/reboot one final time about two years ago, i had to put it on my drop list. The last Apes flick was interesting, but you had to stick around for the end credits and know the first movie well to get the true impact. That and pay attention to the newspaper and I think one newscast in the movie. The biggest thing Battle of the Planet of the Apes has going for it is the fact that Paul Williams, of all people, is in it as an Orangutang. Pretty hard to make it any weaker!